I am somewhat obsessive about learning and reading about the world of concept art. We're lucky to live in this digital age where we have access to incredible tutorials, anecdotal blog posts, concept art projects, tips, and more on the web. It's an age of sharing and cooperating and learning together across continents. I often discover new artists just by following artists that I already know and love, who talk to or post links to the artists that THEY love. Today I discovered Chris Oatley, who has recorded several podcasts with one of my favorite artists, Noah Bradley. On top of these two occasions of recording together, Chris's regularly solo 'Artcast' and blog is filled with a ton of information, everything from his daily routine to avoiding artistic burnout to health insurance for artists... AND free tutorials... AND he runs an online digital painting class. I'm incredbly thankful to people like Chris and Noah, who spend their very valuable time passing down information, free of charge, to aspiring artists like myself. It has now been two weeks since our return from Europe, which in a way seems like yesterday and also seems like a long time ago. I am now engaged to David, which is strange to say, but not to feel. I'm just delighted to be engaged, and despite how amazing the trip was, I'm also very happy to be home. Unfortunately I didn't do too much drawing on the trip itself. Even though we had 2 1/2 weeks, we only had 4 or 5 days in each country/city, so we kept ourselves to a very tight schedule. I probably should have pressed for more sketch time, but it was hard to strike the balance between sightseeing, family visiting (we had an assortment of loved ones traveling with us at certain points), and personal time. During the trip, I also had my very first day of NOT doing a 'daily sketch' all year :( During one of the final days of the trip, in Munich, I had the double-header of getting sick and also visiting the Dachau concentration camp memorial. We came back to our hotel in the afternoon, completely mentally and emotionally exhausted from seeing the memorial, as well as physically exhausted / sick, in my case, and napped until dinnertime... and then after dinner I fell right back asleep. I didn't realize until the morning that I hadn't even done my exercises the previous day. I'm disappointed in myself for missing a day, but on the other hand, I'm in a place where I'm starting to rethink my attitude about art and drawing. I have pretty high goals and aspirations for developing this skill, including potentially trying to get a career in it, and that's fine, it's good to have lofty goals. But I've also realized that having said goals drive me to be mentally unhealthy about it sometimes. I put a lot of pressure and guilt on myself about keeping up with it. Which is also good... to a point. But ultimately I'm starting to try to release myself from feeling too much pressure and guilt. The act of making art should come from loving to make art, not feeling like you have to make art or else the day's been a waste. Your time has never been a waste unless you've spent it in a way that's completely meaningless to you. I would say a day filled with a visit to an extremely important war memorial that made me think deeply about the meaning (and possible lack thereof) behind humanity's failures, resting my tired body, and having dinner with my fiancé is not a wasted day. Art cannot be the sole focus of my life - life has to be the sole focus of my life, otherwise I will have nothing to make art about. 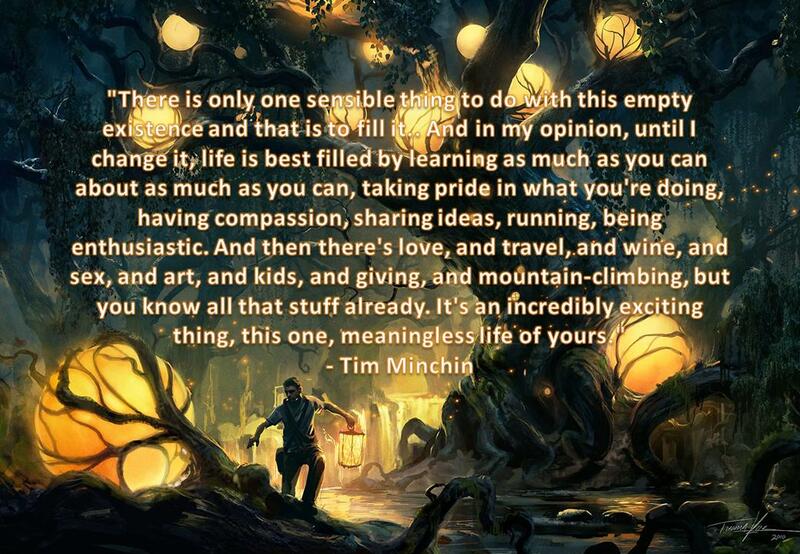 Speaking of the meaning of life and stuff, I was very inspired by this much-passed-around commencement speech by Tim Michin, which seems to speak a lot to this attitude. *Note - his speech ends roughly around 12:00. At the end of the day, that's what art is for me - something to fill my time with, to keep my brain challenged and learning, something to focus on and be passionate about while I figure out my way through this strange thing called life. I don't know exactly where I'm going, but I have a couple ideas, and I think they'll put me in the right place, even if it's not my current ultimate destination.